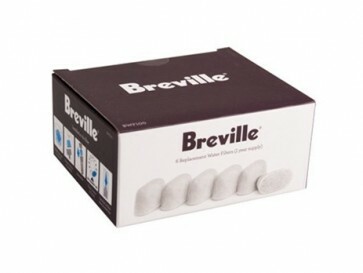 Breville Charcoal/Resin Water Filters keep the water that flows through your Breville Espresso machine crisp and clean. The convenient six pack provides a year's worth of fresh-tasting water. Replacement filters should be changed every two months to reach maximum effectiveness. These replacement water filters work with Breville models BKC600XL, BKC700XL, BES840XL, BES860XL, BES870XL, BES900XL, BES920XL and BES980XL. Integrated water filter fits most Breville espresso machine models. Replace the charcoal water filters every two moths for best results.